The discussion of St Garmon’s Well at Llanarmon yn Iâl, Denbighshire is one destined to open more than a few cans of worms. Which exactly, out of a number of contenders is St Garmon’s Well, and who, for that matter is St Garmon ? The location of St Garmon’s Well has been variously described. Some accounts state that it is close to a place called The Saint’s Crossing, and the field to the north of the site is called Caer Saint. 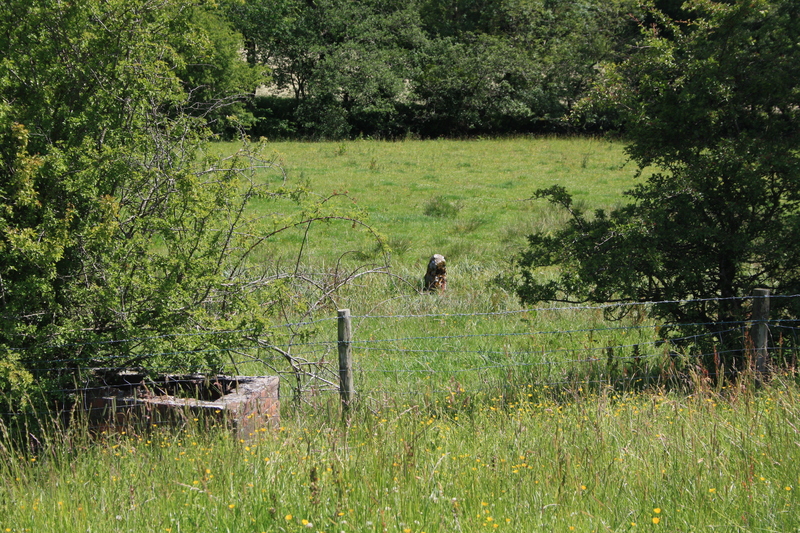 The ordnance survey map shows St Garmon’s Well off the B5431 a mile or two to the south of Llanarmon. This location is actually in Llandegla parish rather than Llanarmon and ties in with the Saint’s crossing description. Tomen y Rhodwydd is the remains of an 11th century earthwork, the site of an early Welsh motte and bailey castle, close to the A525 about a mile to the south of this location. It is difficult to describe this well location as being on “the summit of a rocky knoll”, although there rocky outcrops nearby. The well at this spot has been filled in, apparently in the last few years. 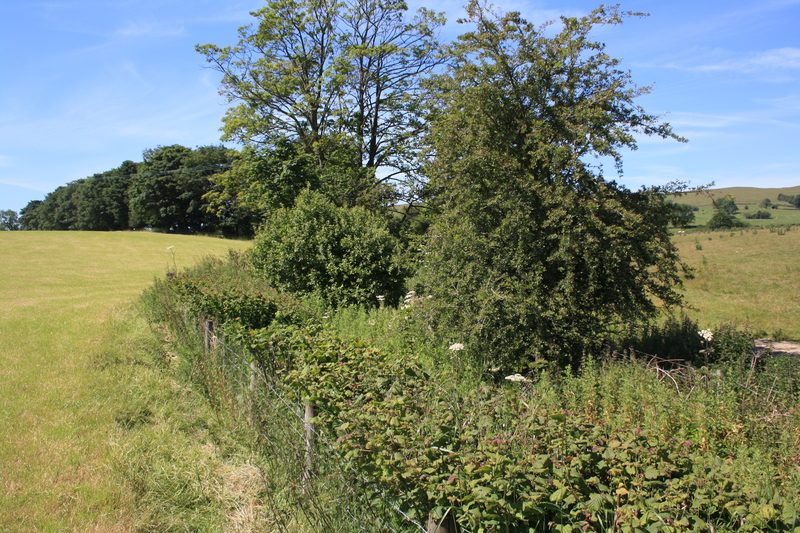 A site visit in 2011 found a dried watercourse running along the side of the field close to where the well is marked on the map. Our best approximation of where the well once stood is shown in the photograph below. There are however other well sites within the area. Another account (source reqd) states “On the side of a hill, about one mile west of the church, is a fine spring of water called St Garmon’s Well”. There is a site referred to locally as Fountain Garmon, which is below the church and much closer to the River Alun. One such site is referenced on the Cymdeithas Ffynnonau Cymru website. We visited this location in July 2011. The whole area was extremely marshy and it was impossible to get close to any specific water source. Two standing stones marked the centre of the site illustrated below. And finally a TV programme Lost Treasures claimed to have identified another potential site, a rectangular well with steps leading down into the water. The location of which is currently unknown. The OS map does show a large number of springs and wells in the area. I visited St Garmon’s well on 06.08.11 – again without much success. I found the dried up watercourse between the barbed wire – but if there is any trace of the well (as indicated on the OS map) it must be hidden by vegetation or destroyed. I couldn’t even find any source of water either. Quite frustrating – especially since St Garmon is a famous saint. I wasn’t aware when I visited it, but have been told since that it has been filled in, I’m not sure when although it has been seen within living memory, and of course it is still marked on the OS maps. At least St Tecla’s well is close by and now has easy access – the church in Llandegla is also worth a visit (it was open on the saturday). They have a brass candle holder believed to have come from Valle Crucis abbey.